Redesigning your website is easy if you know how. Time passes quickly on the web. One day you open up that website that you built for your practice, only to realise it looks stale or out of date. It’s a problem that afflicts a lot of vet websites. In fact, it’s a problem for a lot of businesses, full stop. Except it’s not really a problem. Firstly, let’s get a bit of perspective. 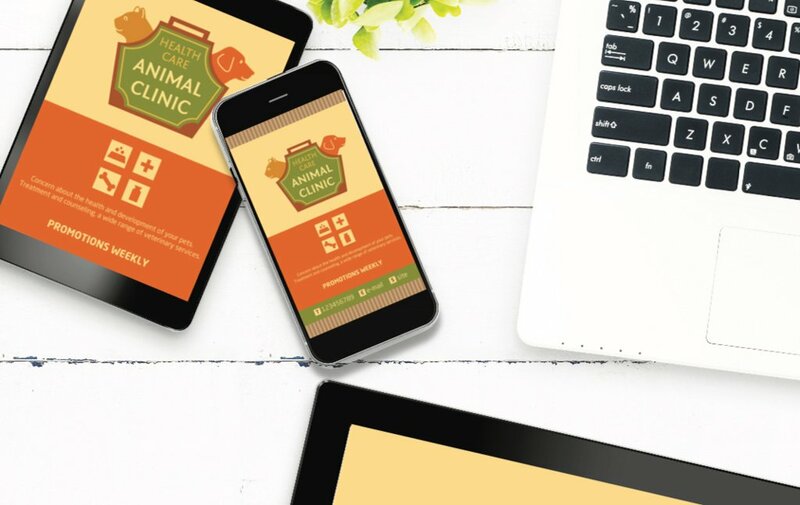 The design of your website is not going to stop someone from bringing their pet to you. At worst, a casual web surfer may snicker if it’s a little out of date. But think of it like your favourite, daggy cardigan. You can stick with wearing that thing until someone you trust gives you a gentle nudge and whispers, time to buy a new one. Chasing fashion in website design, or in anything for that matter, is a hiding to nothing. So don’t worry about winning a competition among all vet websites for who is the prettiest. Focus instead on your substance. What makes vet sites look dated? Now we’ve got that out of the way, take another long, hard look at your home page. There may be another reason why it looks wrong. It could be that it looks exactly the same as the last time you looked at it. And the time before that, and the time before that. If your home page never changes, you’ll get bored with it before any potential patients do. Some businesses are unwilling to change their home page because, in their minds, it’s like the front window of a shop. That’s the way we used to think about websites many years ago—as ‘hanging out your shingle in cyberspace’. That also used to suit people because it was very expensive to build a website. It costs tens of thousands of dollars (like a shop fit-out) and was a huge pain to change anything. The good news is, that’s not how people build sites anymore. Now it’s easier, much cheaper and much quicker to make a large change to your site. The question you should really be asking is what things should you change, and what should stay the same? Let’s start with things you can, and should, keep. Number one is your practice name and corporate logo. They don’t have to be displayed large on the page. But in the eyes of a reader, they are a link between your site and the real world. All the URLs for all the existing pages on the site should also stay the same. You can change the content on those pages, but the URLs are the way search engines index those pages. If you change them, you lose all the page authority you may have previously built up. If you are making large-scale changes to them and feel you need to change the URLs, don’t forget to set up 301 redirects from the old pages to the new ones. Don’t panic if that last paragraph sounds a little too techy. There are easy, cut-and-paste plug-ins that work with WordPress sites that you can use for setting that stuff up. There are hundreds of off-the-shelf templates you can use that will be responsive to mobile devices. Keep an eye out for themes or templates that have lots of positive reviews—they are usually ones that have been tried and tested, and work well for others. Colours, page designs and tricky, artistic fonts are all worth changing. All these date. If you don’t want to keep changing them, I’d recommend keeping your designs very simple, with generous white space, and a nice web font. It’s the design equivalent of a little black dress. It’ll never go out of style. Something worth changing and updating is the imagery on your site. If you are using old photos or stock photos, haircuts and clothing in those pictures can make them look old. It’s worth paying a photographer to spend a day taking lots of pics of staff, facilities and pets. That way you get a library of images you can draw from. Rather than looking at how your site looks to visitors, you should be focusing on how they use it. People don’t just look at vet websites. They use them—even if it’s searching through them for information. If your site doesn’t load quickly, or doesn’t scale and change to suit mobile phones, then you need to change it now. Your site needs to be ‘responsive’—which is to say, it needs to be able to detect the device being used to view it, and change accordingly. First, because more internet searches are performed on mobiles than on desktops nowadays. Second, because search engines give preference to mobile-responsive sites. Again, this sounds tricky and techy, but it’s not. It’s very easy to use a WordPress theme to build a responsive website. Roughly one in four of the people reading this will already have a WordPress site. So you are in a good position to change the theme to a responsive one. All of our websites are built with WordPress—it’s one of those tools that will make your digital marketing much simpler. Finally, add a slider at the top of your home page which showcases your latest blog posts. That keeps your blog posts themselves off the front page, but advertises that you update people regularly with new and useful information. With a simple design, recent images and something that indicates you’re publishing new content, your website will always look up to date. More important is to ensure that you’re thinking about who is using your site, and that you make it as easy as possible for them. That means making sure your site is responsive, and that it loads quickly. More and more, both users and search engines reward functionality and quality content. Make sure you’re supplying both.